PDES is yet another step into the research on collaborative environments, its stimulants, individuals and their mind-sets which forms a group work. 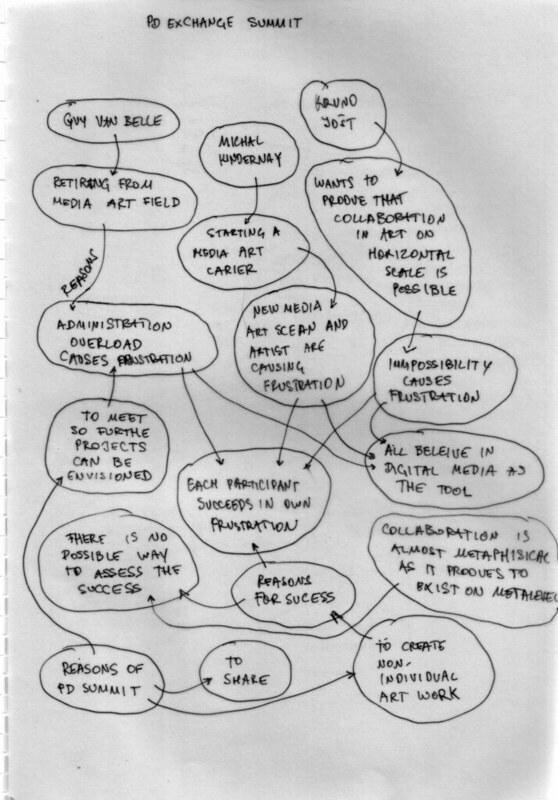 PDES is an example of what are (generally) the themes created in collaborative process orientated work environments that are critical to art itself. give reasons behind your thinking. Sharing ideas and plans for further meetings, funders, etc. 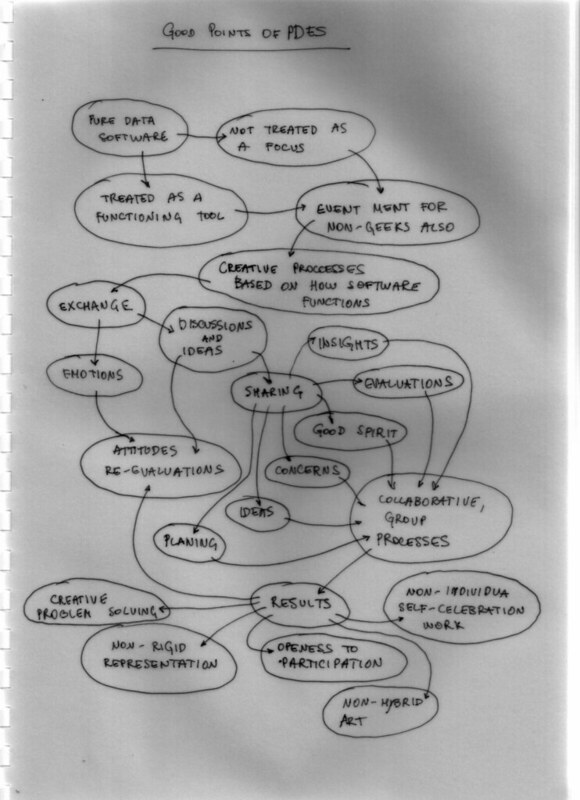 PDES brought this ideas on the table: if one wants to work with Pure Data, one has to retire from art world. Taking that PD is time consuming and concerning we all are taking 80 % of our time working with different bureaucratic instances to get to the point where we can actually use PD as a tool, an idea was to retire so one can use PD. For this idea Guy van Belle wrote an article that was “red” by PD patch projected on the wall. At he same time he was filmed. This material was used at the last day exhibit where few of the aspects of his talk about retiring, and what are geo-political reasons for this besides one to have time to work on PD were corresponded to other texts on this subject. Next work went a step further. Art Pollution Kit (both hardware and software) was introduced as a toll where art pollution was documented. PD was used to analyse recorded materials and this data was visualized. PD patch for art pollution was developed by Michael Kindernay. 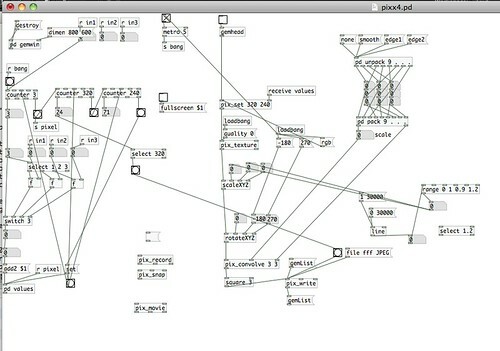 PD patch for analysing art pollution. 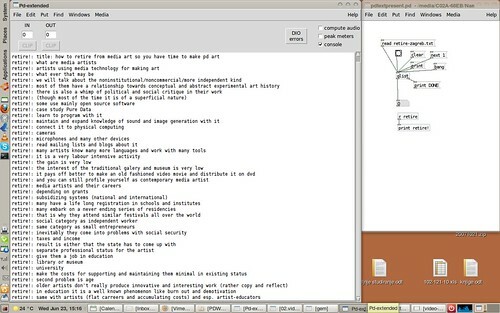 Lenka Dolenova introduced a notion of un-pure data, where documentation of process of all the projects done during PDES by Kruno Jošt was used as starting point to change it and develop parallel perspective by simple analogue way of connections drawing, similar to Pure Datas way of connecting command objects in the software itself. Visitor enjoying Lenka Dolenova un-pure data wall work. 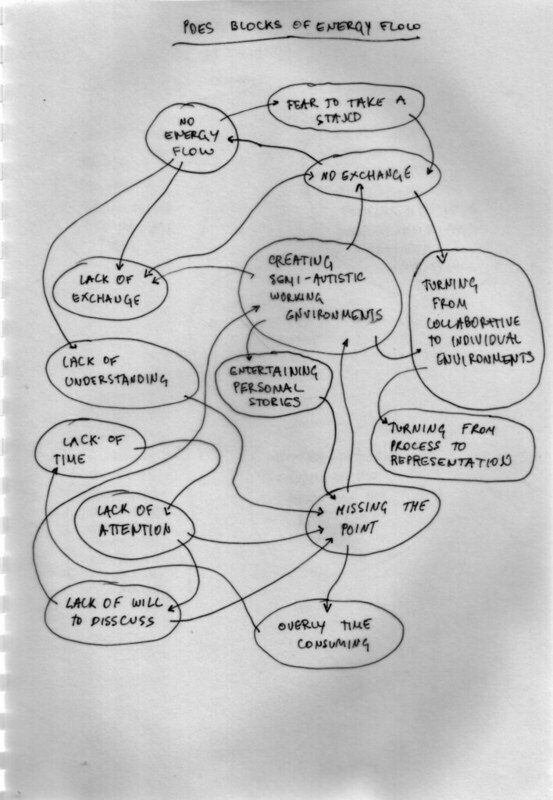 What PDES brought to surface trough discussed ideas while the programs was undertaken is that people beside being open and creative in thinking, for many different reasons can create blocks of energy flow. Evoking the same experience from last year’s EEII festival in ?akovec when at one point of the day all appeared as it will come down and that collaboration did not work. People started to go away from the group into their own individual corners. Next is a diagram of blocks that appeared at PDES. It is hard to get back on track when something like this happens, especially if people start working individually to the point where they cannot let go of the development of the project as they spent so much time in it. So one has to be aware to always moderate and police the timing of when group meeting is in order. Good point of PDES are seen in next diagram. Usually complex software will turn down non-geeks and non-techy creative people. That is why other ways of participating, involving and collaborations have to be envisioned. Sharing has to go in deeper level: sharing time together, so in-between coffees and city walks are also good to exchange ideas. At the end of the day, or in the end of the project, non rigid representation that looks more like fluxus event than exhibition is welcomed, so is the flow of the new comers that are coming into the game.